A Mysterious Chinese blogger apparently predicted the fate of AirAsia flight QZ8501 two weeks before the tragic incident occurred. MOSCOW, December 30 (Sputnik), Ekaterina Blinova – A Mysterious Chinese blogger seemingly predicted the AirAsia QZ8501 catastrophe, providing warnings to potential travelers some two weeks before the tragic incident actually happened. "There is a post on some Chinese forum that is blowing up right now because apparently a user 13 days ago made a post warning people not to go on AirAsia Airline. He explained that the people that brought down MH370 is going to target another Malaysian airline to destroy Malaysia's Air travel industry or something like that and it all has something to do with the US (my Chinese is a bit rusty)," a Reddit member wrote, referring to the mysterious Chinese blogger. The post immediately went viral on social media. 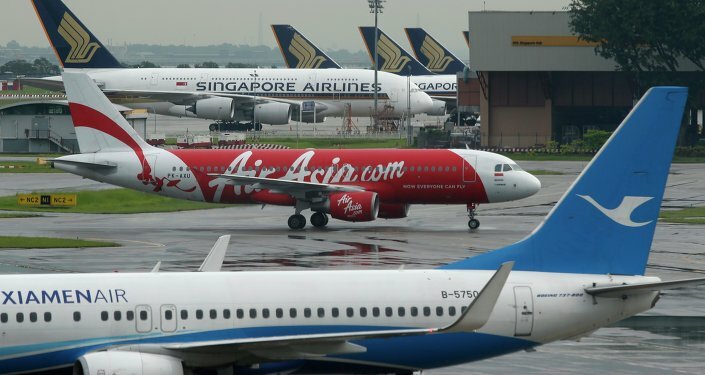 About two weeks ago the Chinese poster warned against using AirAsia passenger airliners, referring to a shadow organization "The International Black Hand." The International Business Times cites the original post written in Chinese: "Black Hand hijacked and shot down MH370 and MH17. This has pretty much killed the 6th largest airline – Malaysian airline." "Now the Black Hand is targeting AirAsia to ruin this airline because it too belongs to Malaysia. Given how powerful the Black Hand is, I suggest that all Chinese planning to travel, should avoid AirAsia, so that you don't disappear like those on MH370. You could be happily vacationing, working, or studying aboard, but if you go on Malaysian airline or AirAsia, you're dead, be careful everyone," the poster calling himself "Landlord" stressed. Has the recent spate of airline crashes changed your attitude to air travel? Yes, it has. I’ll think twice before I buy a flight next time. No, it hasn’t. Flying is one of the safest forms of transport. The Chinese person who posted the warning initially faced a barrage of criticism and was labelled a "conspiracy nut," with forum users questioning why he was so confident in his prediction. "All you civilians get away from the airline. You can still hide, all those who can see the post can still save themselves… Don't be a victim, go hide. Avoid Malaysian airline and AirAsia. Life is precious and your safety is important (sic)," the mysterious 'Landlord' replied as quoted by the International Business Times. Citing the Chinese version of the Epoch Times, the media outlet points out that the Chinese blogger was desperately trying to reach as many people as possible, frequently reposting his message. A few days before the disappearance of AirAsia flight QZ8501, he apparently halted his efforts. Social network users suggest that the mysterious poster could be a Chinese security official, or a hacker, who somehow managed to obtained sensitive data and wanted to save people's lives, while not disclosing his identity or the details of the forthcoming catastrophe.